GPS data after the 2 July 2013 Mw 6.1 Aceh earthquake provide valuable information for understanding the postseismic behavior of a strike-slip fault in northern Sumatra, Indonesia. 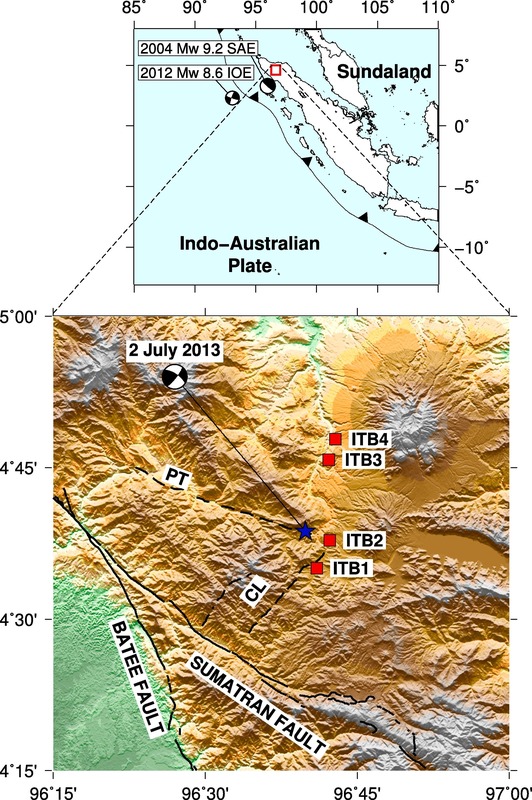 The analysis of postseismic deformation following the 2004 Sumatra-Andaman earthquake and the 2012 Indian Ocean earthquake suggest that the ongoing deformation affected northern Sumatra between July and December 2013. The postseismic deformation of the 2013 Aceh earthquake is herein investigated, with the contribution of poroelastic rebound and viscoelastic relaxation evaluated. The results suggest that the model displacement of those two mechanisms failed to estimate the data. 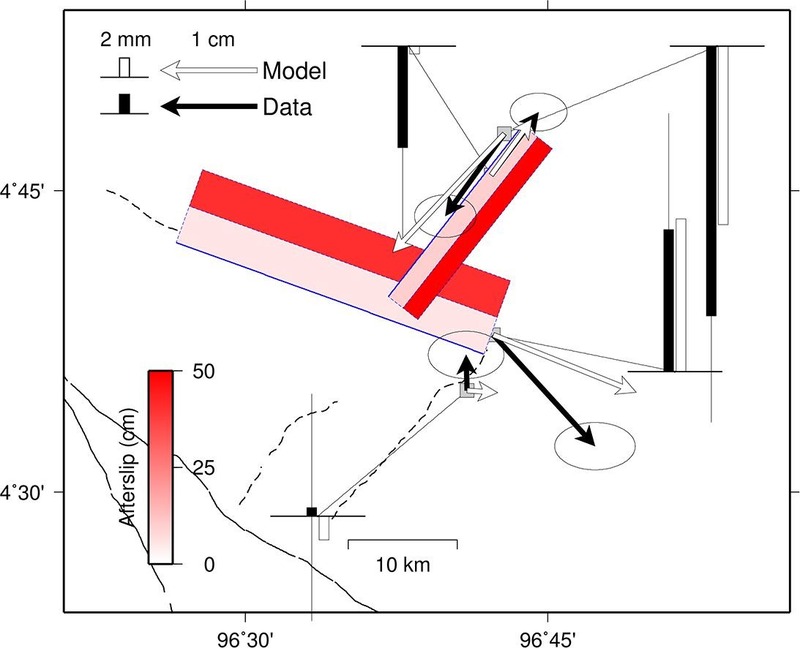 The afterslip analysis of the 2013 Aceh earthquake, on the contrary, fits the data very well with a seismic slip occurring at multiple fault segments of the Sumatran fault in northern Sumatra, Indonesia. The devastating 2 July 2013 Mw 6.1 Aceh earthquake (AE) occurred along a newly identified active left-lateral fault segment of the Sumatran fault in northern Sumatra, Indonesia, identified as the Celala segment (Gunawan et al., 2018). A previous study suggested that the 2 July 2013 earthquake occurred as the Celala segment was 0.1 MPa closer to failure after the earlier 21 January 2013 Mw 6.1 AE (Ito et al., 2016). Prior to the event, the Celala segment was unmapped and unidentified. As a result of this unexpected earthquake event, losses were high. The Indonesian National Board for Disaster Management (2013) reported casualties of 43 people dead and six others missing, with economic losses of more than US$ 50 million; another US$ 70 million was needed for rehabilitation and reconstruction after the disaster. Fig. 1 shows the tectonic setting of this region. Modern geodetic tools such as GPS have been widely used to understand the crustal deformation of the earthquake cycle, corresponding to interseismic, coseismic, and postseismic deformation (e.g. Wang et al., 2012). Previous studies propose postseismic deformation mechanisms after earthquake occurrences, including poroelastic rebound, afterslip, and viscoelastic relaxation (e.g. Freed, 2007, Pollitz et al., 2012). One of the major differences between these mechanisms is the time duration. While poroelastic rebound is in days or weeks, afterslip could take months or years, and viscoelastic relaxation lasts for years or decades (Jónsson et al., 2003, Miyazaki et al., 2004, Lorenzo-Martín et al., 2006). This study analyzes the postseismic deformation of the 2 July 2013 AE by considering these three postseismic deformation mechanisms. Unpublished GPS data available in the region are used for the analysis. The contributions of postseismic deformation after the 2004 Mw 9.2 Sumatra-Andaman earthquake (SAE) and the 2012 Mw 8.6 Indian Ocean earthquake (IOE) are considered in the analysis.